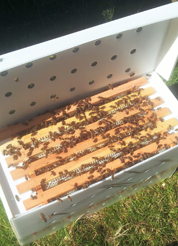 Apistan is easy to use, simply insert two strips in the brood box for a period of six weeks (two brood cycles). The strips should be inserted, spaced apart hanging on different frames fairly centrally in the brood nest where bees will walk over them. Ideally bees should be treated at the end of the season, but treatments are possible at any time of year. As the bees come into contact with the Apistan strip, they pick up a minute amount of tau-fluvalinate – whilst another similar minute quantity emerges from within the strip to take its place on the surface becoming available for other passing bees. As the bees interact within the hive, the active ingredient is spread throughout the colony.